• Thomas W. Robinson Jr., 53, 1415 S. Valley St., New Ulm, was charged with felony receiving stolen property and felony 5th-degree drug possession-not small amount of marijuana June 6. 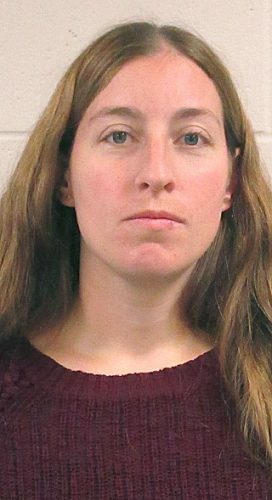 In addition, Felicity D. Marczak, 30, Russell, was charged with felony 5th-degree drug possession-not small amount of marijuana and misdemeanor possession of hypodermic syringes or needles. According to court documents, New Ulm Police were doing surveillance and had a search warrant for a residence at 1415 S. Valley St. on March 14. The warrant was related to a Watonwan County burglary that included two handguns, $20,000 in jewelry and tools, and other items. Executing a search warrant, officers encountered Robinson plus a pipe used to consume methamphetamines and a drug kit with about two grams of methamphetamine in a bedroom. Other items found relating to burglary included an Infinity laptop computer, dream catcher (handmade willow hoop), flash lights, knives and tools. The value of the items was more than $1,000. Robinson’s record showed he was convicted of a 5th-degree controlled substance crime, possession of a small amount of marijuana, possession/sale of a small amount of marijuana-not remuneration and possession of drug paraphernalia, all in Blue Earth County. Officers encountered Marczak and found a plastic drug kit with items used to consume meth plus three bags with about one gram of meth. Talking to police, Marczak opened her wallet and exposed a hypodermic needle commonly used to consume meth. She was convicted of possession of a small amount of marijuana and drug paraphernalia possession on Dec. 14, 2010 in Pipestone County Court. • Miranda D. Staudinger, 30, 2526 S. Bridge St., New Ulm; and Shawn H. Staudinger, 36, St. Paul, were charged with gross misdemeanor counterfeiting of currency June 6. According to court documents, New Ulm Police were dispatched to South Point Credit Union in New Ulm on Jan. 23 regarding suspects in possession of counterfeit money. A bank employee showed police four $20 bills. Two of the bills had the exact same serial numbers, making it immediately apparent they were counterfeit. Police interviewed three suspects after reading them a Miranda Warning. One suspect, a juvenile, said he did not know who gave the money to a bank teller. Shawn Staudinger said he worked for a moving company and sometimes gets tips for his services. He said he and his new bride, Miranda Staudinger, pooled their money and she gave the bank teller $450 to put into an account. Shawn Staudinger denied knowing where the four counterfeit $20 bills came from. Miranda Staudinger told police she and Shawn were doing odd jobs around New Ulm including shoveling snow, which was how they earned the money they deposited. The next day, police learned that the Mankato Department of Public Safety had a case file with serial numbers on one of the bills recovered in the case that matched a $20 bill recovered in a search warrant. In addition, New Ulm Police learned that Winthrop Police were investigating the passing of a counterfeit $20 bill on Jan. 22 with the same serial number of a bill believed to be counterfeit. Winthrop Police were reviewing surveillance video to determine who passed the bill. • Austin A. Telthoester, 20, Eastwood Estates, Redwood Falls, was charged with felony domestic abuse No Contact Order-violate No Contact Order within 10 years of first of two or more convictions and misdemeanor driver must carry proof of insurance when operating vehicle and child passenger restraint system-child under eight and under, not fastened. According to court documents, New Ulm Police were westbound on 20th North Street when they were advised of a vehicle southbound on Broadway without its headlights on. Police stopped the vehicle, talked to a male driver and observed an adult female in the front passenger seat with an infant lying on her lap that was not secured in any way. Two small children were in the back seat wearing seat belts. The male driver, identified as Telthoester, said they were on the way to the hospital as the infant was not feeling well. He did not have current proof of insurance on the vehicle. Police ran his driver’s license that showed a probationary DANCO (Domestic Abuse No Contact Order) on March 13. It prevented contact with the victim, identified as the woman in the vehicle. Telthoester was uncooperative with police but was transported to the Brown County Jail. He was convicted of domestic assault by strangulation on March 12 in Redwood County and of a DANCO violation on March 12 in Redwood County.